And then there’s the hills. Getting around New West, or getting into and out of the city, will inevitably mean ascending or descending some sort of incline. Patrick Johnstone, a newly-elected city councillor and committed cyclist who often commutes by bike to his day job at Richmond City Hall, says New Westminster is working on improving infrastructure for cyclists. The city’s Master Transportation Plan that was adopted in 2014 after considerable consultation with the community envisions a long-term bicycle plan that focuses on providing facilities and routes that are comfortable for people of all ages and abilities that are separated from traffic or follow low-volume or low-speed traffic environments. New Westminster councillor Patrick Johnstone says the city is working on closing gaps in the cycling infrastructure. Work will begin this spring on finishing the Brunette-Fraser Greenway through the Braid industrial corridor. Already cyclists can criss-cross New West on various bikeways including the BC Parkway, the Central Valley Greenway, the Crosstown Greenway, the London/Dublin Greenway and the Brunette-Fraser Regional Greenway. They’re all designated with signage and on readily-available bike maps. But there are significant gaps. 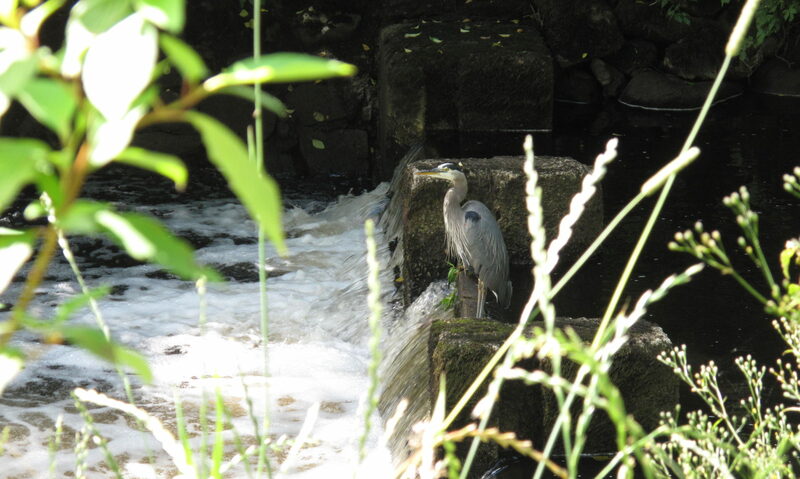 One of those, through the Braid industrial area, will be addressed beginning this year with the help of a $450,000 grant from the federal Canada 150 Community Infrastructure Program. The money will be used to complete the 16 km Brunette-Fraser Regional Greenway that connects the Brunette and Fraser rivers. When it’s finished in 2017, the Greenway will become a jumping off point for the city’s longterm vision to connect the entire waterfront with a multi-user path that will take cyclists and pedestrians from Sapperton to Queensborough. But that’s still a ways off, says Johnstone, as properties have to be acquired, access rights near the railroad tracks that bisect much of the waterfront have to be negotiated. That’s not always easy, nor cheap, says Johnstone. In the meantime the city is striving to make cycling more convenient by improving bicycle parking, encouraging developers to consider the needs of cyclists in new buildings and retrofitting bike facilities into existing buildings, supporting TransLink in its cyclist-friendly initiatives like secure lockers at SkyTrain stations and bike racks on buses. 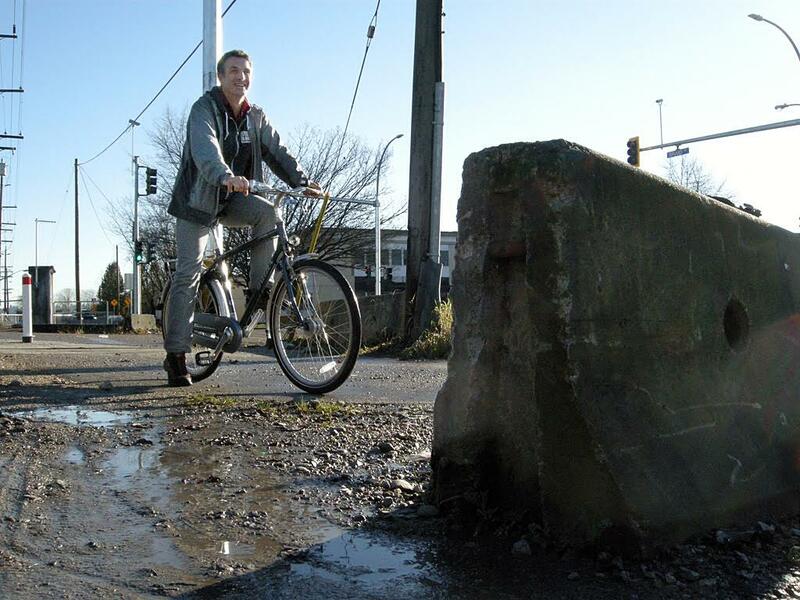 Johnstone says there are still barriers that make cycling difficult in New Westminster, including actual physical barriers that abruptly end designated bike routes. He’s also a believer that helmet laws are a barrier to the broad adoption of cycling. Safety is being addressed by giving cyclists greater priority at intersections, better marking and maintenance of bike routes. 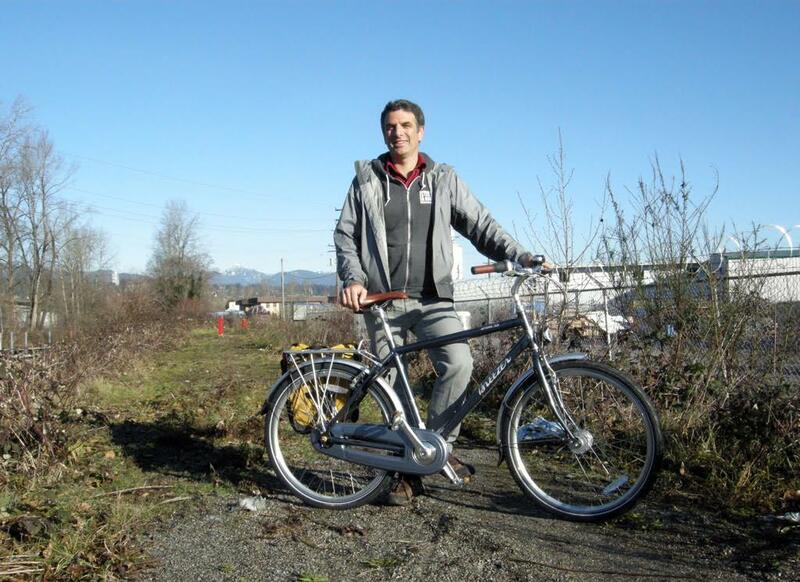 But no amount of civic policy or good intentions can shield New West’s cyclists from the city’s hills. Rather than fear them, riders of all abilities should embrace them, says Hobbis. “If you’re going to ride a bike in New Westminster, you’re going to need the gearing to get up the hills and the attitude that you can do it,” says Hobbis. That’s exactly the approach taken by Guy Wilson-Roberts, a keen recreational cyclist who started the Fraser River Fuggitivi, a road-riding group based out of River Market, five years ago. Instead of taking the easy way from the waterfront along Stewardson Way beneath the SkyTrain guideway, Wilson-Roberts often points his bike up the inclines of Third Avenue, Tenth and Fourth streets. 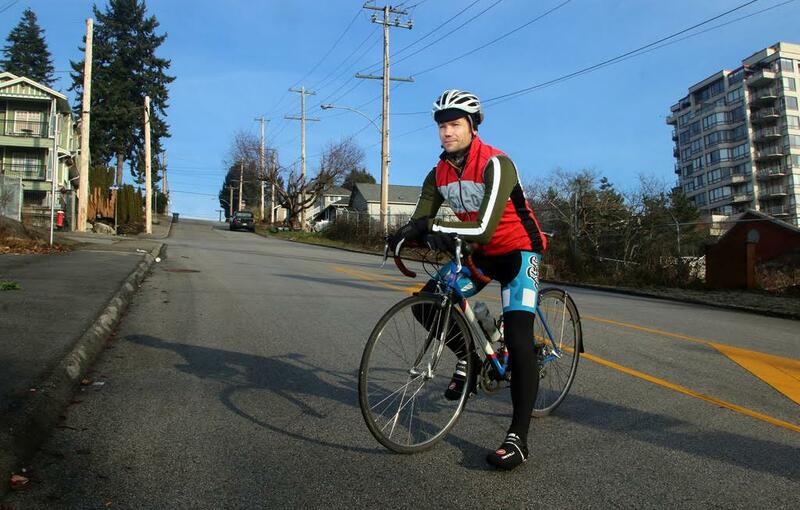 Guy Wilson-Roberts, a recreational road cyclists, at the base of one of New Westminster’s steepest hills, Third Avenue. Careful route planning can minimize the pain to your thighs, says Wilson-Roberts. But mostly it’s about keeping a positive attitude. Besides, chugging up and down New Westminster’s hills can bring quick fitness benefits that will soon flatten those inclines. And your girth. Guy Wilson-Roberts crests the Third Avenue climb from 12th street. 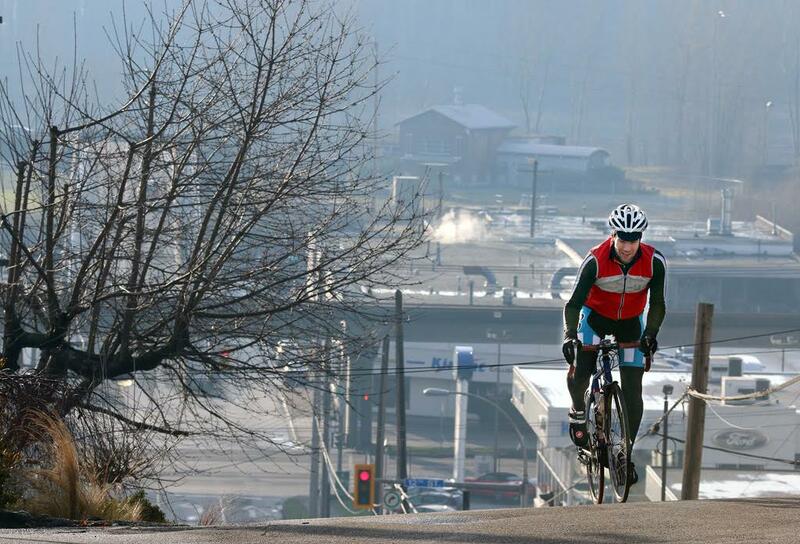 He says a good attitude, hard work and a reasonable pace can get any cyclist up New Westminster’s hills. There are numerous resources available to new and experienced cyclists in New Westminster.